Straw-bale home construction is a building method that uses bales of straw (commonly: wheat, rice, rye, and oats straw) as structural elements, building insulation, or both. The first straw-bale structures we know of were built about a hundred years ago by European settlers in the Sand Hills of Nebraska. Having little other means to shelter themselves, they were driven by necessity to improvise. Using the newly invented steam and horse-powered balers, they baled the grasses that surrounded them, stacked the bales to form walls, and applied mud or cement plasters inside and out. Some of those homes still exist and are in good shape, as are a few more that were built in Nebraska and Wyoming over the subsequent decades. A revival in straw-bale construction began in Ontario in the 1970s and has now spread all over the world. Bales might be two-string or three-string, of any grain (typically, in North America, wheat, rice, oats, hops, barley or rye), and are not homogeneous; that is, they have some “grain”— different qualities in different directions—based on how the baler works. The narrow end faces receive the compression of the baler head, which thrusts straw masses in “pulses” into the chamber. These pulses, when compressed, become flakes of about 4 inches (102 mm) in thickness. Thus, a typical bale consists of a series of 4-inch (102 mm) flakes compressed along the long axis. Because the baler is operating continuously with a series of slightly varying pulses of straw mass, and because it will only cut and tie off a bale at the end of a flake, the bale length will vary by a few inches. The different types of grain straw have varying chemical compositions and inherent strengths, rice straw being perhaps the toughest due to an unusually high silica content. However, the micro properties of straw appear to be far less important than the macro properties of straw bales. Experience, and some laboratory testing, strongly suggests that moisture content, density and history (the history of bale storage and protection from harvest to construction) are the primary determinants of bale quality. Moisture content will depend on the circumstances at the time of baling and during subsequent storage and transport; quality control and inspection of a straw-bale job requires the use of a bale moisture meter, available from farm supply houses. Bale density will vary depending on the type of grain, moisture levels and the degree of compression provided by the baler, but should be at least 7 pounds per cubic foot if intended for use as a load-bearing element. The size of the bales varies with local custom and prevalent balers, although 23 inches by 46 inches by 16 inches (584 mm by 1168 mm by 406 mm) is more or less standard for three-string bales (two-string bales are much smaller). Until construction standards are established for straw bales, prudent design and inspection must allow for the actual qualities of the particular bales selected for the given project. As a practical matter, specifications must be phrased as performance criteria, such as maximum allowable moisture content at the time of erection and minimum density. History, if not well known, can be checked by visual inspection and smell; it is usually obvious (if not quantifiable) when bales have been left out in the rain. 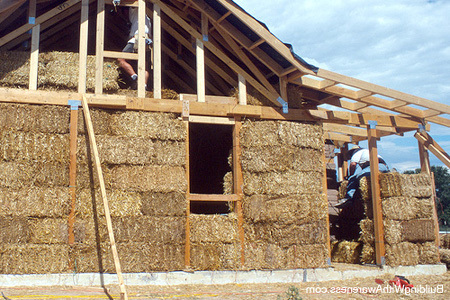 There are two basic styles of straw-bale construction. 2.) Post-and-beam straw bale denotes construction in which no weight of roofs or floors above the ground is supported by the bales. Rather, bales are used as infill panels between or around a structural frame, which can be wood, steel, concrete or masonry. This type of construction has become predominant as builders often find it more adaptable and more readily acceptable to building officials, lenders, and insurers. Despite the obvious differences between these two basic types of structures, there are many qualities common to all straw-bale buildings. Virtually all are plastered straw bale, where “plastered” is used generically to include traditional mud-based plasters, lime and gypsum plasters, shotcrete or gunite (concrete pneumatically shot from a nozzle), cement stucco, and various combinations. In thinking of plastered straw-bale walls, it is essential to understand that, once plaster is applied directly to either one or both bale surfaces, the structure is now a hybrid of straw and plaster. Effectively, any further loading—snow, people, the wind, earthquakes, etc.—will go mostly or entirely into the plaster skins. This is because of the relative stiffness, or the relative moduli of elasticity of the two disparate materials. Any plaster is far stiffer than the straw, and will therefore “attract” any subsequent loading, much as a sharp stone in the sand will “attract” the weight on your foot. When a wet snow or earthquake loads a plastered straw-bale structure, the soft, flexible straw yields, and the brittle plaster “skin” attracts all the stresses. Unlike in a pure concrete structure, however, where such a failure of a bearing (or shear) concrete wall or column could be both sudden and catastrophic, the failure of the plaster skin would throw any loads back on the straw-bale assembly. The capacity of the bales to pick up the load yielded by cracked plaster is fairly substantial. Tests conducted in various laboratories over the past ten years have proven that an unplastered wall can carry an appreciable amount of vertical load, as well as some In-plane and out-of-plane shear, and would, therefore, provide a backup against a failure of the plaster skins. Furthermore, recent tests in Washington and California have revealed the surprising strength, ductility and toughness of plastered walls, even when cracked and subjected to cyclic loading. We are finding that the bale walls when plastered on both sides, behave much more like an integral sandwich panel structure than might be expected. The structural model is complex: Rigid inside and outside skins are attached to the comparatively soft straw-bale “masonry” assembly. The skin material can be known, but the thickness will vary appreciably as it fills in the gaps and notches. Most important to the whole package, there is both some shear capacity in the bales and some shear transfer capacity between the bale surfaces and the skins. Though it is essential to see the plaster skins as the primary load-carrying elements, it is nevertheless also important to recognize that the straw bales are still crucial elements of the package. This is analogous to the relationship of the web to flanges in a steel I-beam: The flanges (skins) carry bending loads, but rely on the shear capacity of, and connection to, the web (in this case, the straw-bale assembly). So the assembly consists of strong, brittle, thin “concrete walls” braced by, and somewhat elastically connected by, the straw-bale core. There is now enough accumulated testing and anecdotal evidence to make reasonable predictions about the behavior of plastered straw-bale walls under various load conditions. Using data from the Albuquerque out-of-plane tests on plastered and unplastered walls, it would seem that a plastered straw-bale wall is 20 times stiffer than its unplastered counterpart, but still about 600 times less stiff than a true sandwich panel. (Space limitations here preclude a more in-depth analysis, but the data supporting these conclusions, as well as some test result summaries, can be found in Buildings of Earth and Straw by this author.) As more tests are done to investigate straw-bale wall behavior, some usable approximation of wall moment of inertia, such as 1/600 of the wall “pure” sandwich panel moment of inertia, should become apparent. It should be clear that plaster coatings should always be worked directly into the straw. All testing and experience to date has shown a huge increase of strength from an unplastered to a plastered wall assembly when the plaster skins are bonded to the straw substrate. In areas of heavy snow, temperature extremes or seismic risk, making use of the integrated system also requires reinforcing for the plaster skin, which has no (useful) tensile strength. That reinforcing can usually be a conventional hexagonal 17 gage stucco mesh, but for particularly heavy loading, may need to be some form of welded wire mesh with a comparatively tight weave such as 2 inches by 2 inches (51 mm by 51 mm) with 14 gage wire. Design and detailing of edge conditions may also be necessary at any boundary considered to transmit loads. Since the bond provided by working the plaster into the straw is more than adequate to hold the plaster in place under load, many, including this author, believe that mesh reinforcing need only be attached well enough to stay in place during plastering. Weaving, stapling or tying stucco netting to or through the bale wall is labor-intensive and of highly uncertain value. The structural frame for an infill bale wall can be anything the local codes allow, with detailing as appropriate. Analysis for vertical and lateral loads is conventional, and the bales must simply be supported for their self-weight and out-of-plane loads. With conventionally proportioned buildings, the plastered sandwich panel behavior is more than adequate to resist out-of-plane loads even in Seismic Zone 4, though care must be taken to secure edges and transmit loads to the frame surround. One advantage of infill straw-bale construction is the introduced option of stacking the bales on edge, thereby reducing wall thickness. Tests have shown that bales on the side have a little load-bearing capacity but have a higher R-value per inch, so the net thermal insulation of an edge-stacked wall is about the same as a flat-stacked wall. Builders report that plastering is made more difficult because the straw is presented across the face of the exposed wall, as opposed to the end grain exposed in a flat-stacked wall. Notching the straw for conduit is also made problematic because the strings are left exposed when bales are stacked on edge. A typical foundation detail for a load-bearing straw-bale house on a concrete slab on grade. Bales will sit on treated wood sill plates bolted to the foundation, with pea gravel in between as a capillary break. All the bales were stacked, and the roof-bearing assemblies were in place and being strapped down by lunch time on the day of the wall-raising for this load-bearing straw-bale house built by the Town of Guadalupe, Arizona. By midafternoon, all the trusses were in place. By the end of the day of the wall raising, the roof was sheathed and ready to be dried in. The finished house in Guadalupe, with a typical three-coat stucco finish. It cost less than $50,000 and is a very energy-efficient, 1,120-square-foot (104 m2), three-bedroom dwelling. In-plane earthquake and wind loads can be carried by the plaster skins, as discussed above. Wind forces have yet to cause any problems in straw-bale projects to date. For example, the Real Goods Solar Living Center in Hopland, California, was struck in December of 1995 with a record windstorm that wreaked havoc up and down California. That building, was particularly vulnerable at that time, for there was no glazing on the huge south walls facing into the storm winds, and the building’s shell shape collected and focused winds onto the north bale walls (coated with a thin gunite substrate and an earth plaster finish coat), which were completely undamaged and uncracked. In another case, load-bearing straw-bale walls in Pensacola, Florida, easily survived a powerful hurricane—before they had been plastered. In short, the empirical evidence to date tells us that straw-bale walls of conventional dimensions are not appreciably affected by high winds. Bracing typically consists of light gage metal straps, steel plate or slender all-thread bolts set diagonally across the surface of the bale wall and protected by the plaster. The diagonals must be designed for calculated forces and adequately fastened to the top plate and foundation. However, because even lightly reinforced cement stucco on straw-bale walls has surprising strength, ductility, and toughness, and as further testing is conducted, reliance on the reinforced plaster/sandwich panel behavior will likely increase in engineering designs. American Society for Testing and Materials fire tests have been conducted on plastered straw-bale wall assemblies in Albuquerque and California, each of which showed enormous resistance to flame spread and temperature rise. This is apparent because the bales are typically too dense (lacking in oxygen) to support combustion, and even when unplastered will tend to char on the outside as does a heavy timber beam. Effectively, fire is not of great concern for the completed structure, but it is of enormous concern during construction. While the walls are going up, a lot of cutting, notching, and reshaping of the bales will invariably leave the site covered with loose straw, which is highly flammable. Common sense dictates that the site is swept clean regularly in this phase, that fire extinguishers or hoses be readily available, and that any welding, cutting, brazing, etc., be done with extreme care. If the design has bales on an edge (with the ties exposed), then the walls are vulnerable to fire until the plaster is applied. Water penetration, as with any other type of construction, is a potential problem. Straw left in a moist, aerobic environment [generally, above 20 percent moisture content and 50°F (10°C)] will support the growth of molds, which leads to decay of the straw. Even for a post-and-beam structure, this can be a problem, as degradation of the straw leaves the plaster unsupported and can release mold spores into the air that may be hazardous to health. For these reasons, moisture issues receive particular attention from straw-bale designers and researchers. 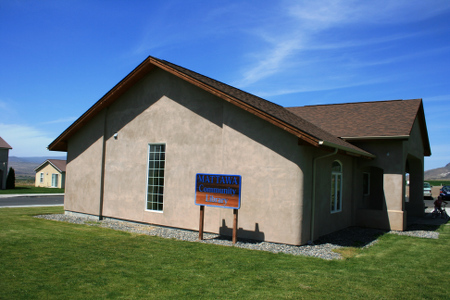 The overwhelming experience with straw-bale buildings is that moisture vapor intrusion is not a problem if the wall can “breathe”; that is if both surfaces are vapor permeable. There have certainly been leaks and degradation failures, but without exception they have been due to outright moisture intrusion, not vapor intrusion. Although moisture considerations are related to the climate—arid regions will tend to pull moisture out of any wall package, whereas warm or cold humidity presents specific vapor problems—moisture control must largely focus on preventing leaks. In short, and to perhaps oversimplify, it seems that water vapor should be allowed to move in and out of the wall assembly while extra care must be taken to keep liquid water out. Tops of bale walls, exposed horizontal surfaces (that is, windowsills), and joints with wood frames must be carefully sealed and designed to shed water. As with fire, the structure is especially vulnerable during construction, as bales and walls can be wetted by rains, appear to dry out, and then develop problems after the wall is completed. Extra effort must be made to store and protect the bales all the way from the field of origin to the completed building. This leads to the most important, unusual (and seemingly counterintuitive) feature of accepted straw-bale construction: No moisture or vapor barriers should be used except possibly for the first few courses on the outside, window sills and tops of walls to provide protection during construction and backup against a roof leak. Building permit reviews have commonly generated the requirement to cover the bales with a barrier such as Tyvek or Grade D paper (as is done over studwall sheathing, though the evidence is emerging that even here moisture barriers can trap moisture where it can cause harm), and the argument has been waged many times in many jurisdictions over this subject. 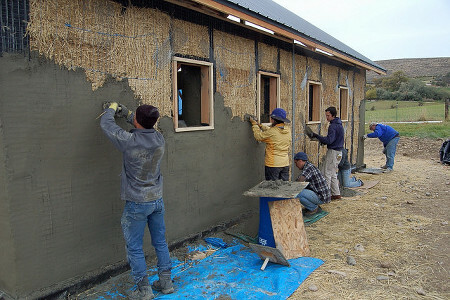 However, experience with straw-bale walls overwhelmingly shows that no barrier should separate the plaster and straw because the straw needs to breathe (transmit water vapor), moisture must not be trapped against the straw/plaster interface, and the structural system depends on a thorough bonding of plaster into the straw. The bottom of the bale wall must be well separated from the foundation; at the very least, a waterproof barrier should be laid over a supporting concrete surface to halt any wicking moisture from below. Additionally, many builders are laying a 1-inch (25.4 mm) layer of pea gravel between 2-by-4 plates along the inside and outside faces, thereby ensuring that the bales will never be sitting in water. Though they are stacked like masonry, straw bales are comparatively soft and do not behave like bricks. Except where surrounded by a sturdy frame of posts and beams, the bales must be braced or pinned during stacking for stability and alignment. Internal pinning of the walls (with rebar dowels) has been prescribed in straw-bale codes to date, but is an area of some controversy, for it is not known how much contribution internal pins make to the strength of the finished wall assembly. (Most testing to date has been on pinned walls.) Field reports strongly suggest that exterior pinning (paired rebar or bamboo dowels against the bale surfaces that are tightly connected through the wall with heavy wire) is easier to build and apparently stronger, but much testing is still needed on the subject. A big consideration, also a somewhat unexplored field of study, is the long-term creep deflection of the bale wall. Straw builders have found that an 8-foot (2438 mm) wall can lose ½ to 4 inches (12.7 to 102 mm) of height in a few weeks from its weight and added roof weight. Builders have found, though, that these deflections are drastically reduced if bales are emphatically stomped into place both downward and against adjacent bales. Knowing that any appreciable settling of the straw will induce unwanted stresses, and possibly cracks, in the rigid plaster skins that are already in place, builders have historically let the loaded walls settle as long as possible before applying plaster. More recently, however, rather than waiting for the roof weight to compress the bales, some builders have been precompressing the walls mechanically. In earlier buildings, this was accomplished with all-thread rods every 6 feet (1829 mm) or so beside or through the bales, connecting top plates to the foundation and tightened with nuts at the top. Unfortunately, some precompressed walls were found, a year later, to have settled further beneath compression nuts, while others are (so far) performing well. Others have introduced the use of elastic polyester package strapping or heavy gage (fencing) wire wrapped over the wall and down through the footing, in both cases cinching down the bale assembly to the foundation at close intervals, such as 2 feet (610 mm) on center. In a more elaborate system developed in Canada, stucco mesh sheets on both faces of the bale wall are grabbed from the top with oak bars, tightened upward with car jacks or inflatable bags (which push down on the top plate, compressing the straw) and secured in a taut condition. All these systems show more promise than the all-thread systems because the tighter spacing allows for some leveling of the wall top by adjusting relative tensions, and because their elasticity (springlike behavior) permits them to maintain some compression on the wall even if it settles. Elastic precompression may also supplant internal pinning, as the compressed bale assembly has superior strength to ordinary (pinned) walls. However, the long-term ability of chicken wire mesh, heavy gage wire or polyester strapping to maintain high tension, as well as their use in this type of construction application, is untested. Anecdotal reports to date are highly positive, but the use of these tensioning systems should be controlled and conservative until there is more of a track record and laboratory testing to verify long-term behavior. The foundation must keep the bales well above grade, and the roof should provide a wide overhang—the proverbial “good hat and a good pair of shoes.” Roofs are conventional, connecting to the walls via some manner of top plate or bond beam (most commonly a plywood and “two-by” assembly, though many top plate assemblies have been tried). The top plate serves like the double top plate in a studwall—as a bearing surface, as a tie beam under lateral loading, and as a fastening point for plaster reinforcing. Windows and doors are typically framed wood bucks that either sit on the foundation or “float” in the bale wall and require expanded metal lath strips over paper or bituthene to reinforce the plaster tightly at straw/wood joints. Cabinetry and fixtures are screwed to wooden stakes pounded into the straw, and conduit can be let into grooves carved by chainsaw or “weed wacker” into the straw surface. Over the past ten years or so—the dawn of the straw-bale revival—a growing number of people has been building and experimenting with straw bales as construction materials. There now exists a body of testing and anecdotal knowledge about straw-bale structures that, while modest and inexact, gives us some basis for understanding how these buildings work. No-load-bearing bale structures are relatively straightforward, and structural design of the bales simply involves allowing for self-weight and the lateral pressure on bale panels induced by wind or earthquake. Load-bearing straw-bale buildings in high snow or earthquake areas can tentatively be designed using cement stucco skins (detailed and built for a clear load path from roof to the foundation) to carry live loads. Backup (or alternate primary) lateral force systems, such as diagonal bracing, must be built into all but the most simple buildings in Seismic Zones 3 and 4. Plastered bale buildings never threatened by heavy snow or earthquake are far less problematic, and a wider, less restrictive range of plasters, foundations, and architectural shapes can be perfectly satisfactory. All straw-bale structures need particular attention to moisture detailing, to fire control during construction and to bale quality. 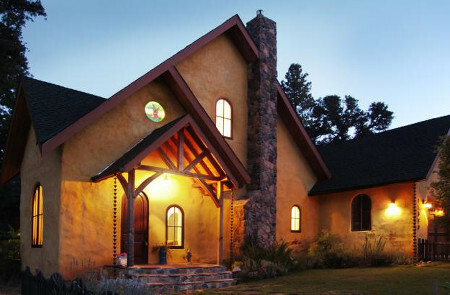 It is worth noting and emphasizing that there exist many load-bearing straw-bale homes in Nebraska and Wyoming that have peacefully endured almost a century of snowstorms, high winds, temperature extremes and human occupancy without ever having had the backup of rebar pins, precompressing, engineered foundations and other features that have been deemed crucial. Those houses are out there, uncracked, unrotted, unburnt, possibly as much a testament to the value of common sense in construction and maintenance as to the strength of straw-bale construction. As a methodology for engineered design and building code regulation of plastered straw-bale buildings evolves over the years to come (along with the continued evolution of straw-bale building technology itself), it should continually reflect back on its basis in these impressive examples. For more of straw-bale house click on video bellow.